The Emilia Collection is rooted in the natural beauty of roses, brought to hard lines of the acrylic flowers and metal attachments. 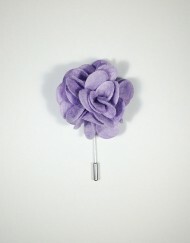 These lapel pins make a statement about your style, and willingness to express yourself. Please see third product photograph for visual of silver or gold stick pin. Choose either a silver or gold stick pin to complement your style.